I feel so fortunate. That’s all I can think about after all of the amazing things that I got to be a part of this weekend at Sewdown Nashville. Every part of the trip held its own affirming moments, and I think I balanced being in the moment with making notes and taking pictures to share with all of you here. I got to meet some pretty special people, whether they were geeking out with me or teaching me something new. First of all: Nashville, you are awesome– relaxed, authentic, unpretentious and beautiful. I got to travel with four other members of NJMQG (we met another two who drove there), and we arrived on Thursday night, intending to take in some southern culture. We didn’t make it off the tourist track in the one day we had before Sewdown began, but if Broadway is that cool, then I’m sold. We ate Tennessee ribs and danced in the honky tonks, where the music was great and the drinks were strong. On Friday morning we visited the Frist art museum. 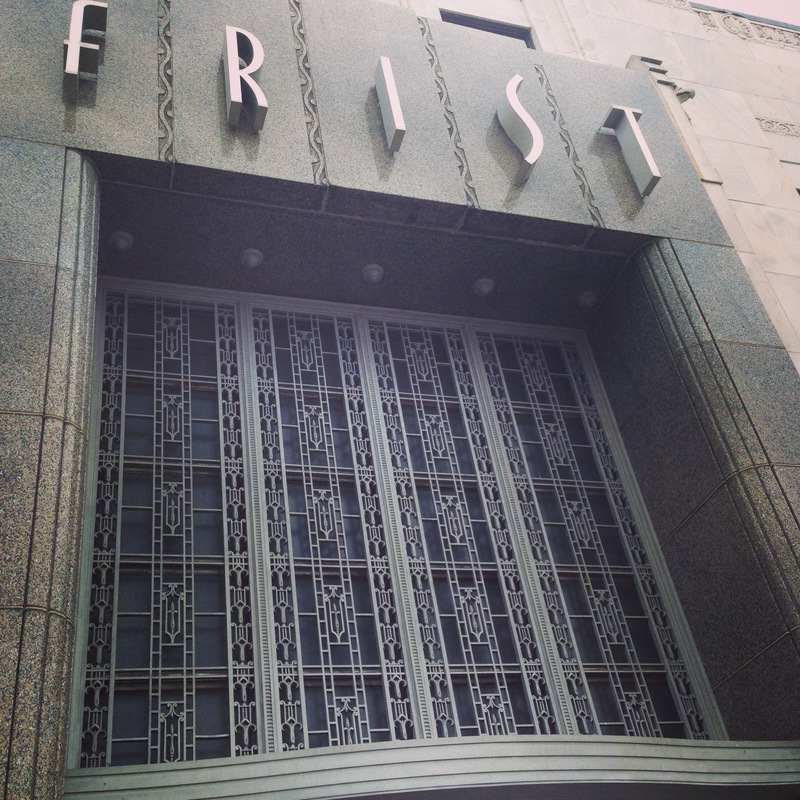 The art deco architecture was stunning, and the exhibits inside had something for each of us, from Van Gogh and Monet to Goya and contemporary Nashville native Lain York. I had some amazing conversations about color and design, relationships and personal history. The Sewdown began with a reception at Anna Maria Horner‘s home and studio. It was so perfectly her— there was color and music and warmth radiating from every corner. And I mentioned that Nashville was unpretentious– for all the beauty and art and success that fills the house, it was completely real and approachable and lived in. The fabric room– I think the MQG nearly cleared this out! Next we stopped at a new fabric store, The Fabric Studio, for a little shopping before heading back to the gorgeous Loews hotel for Open Sew. I met some amazing women from North Carolina, eating truffle fries with some Shady Ladies from Asheville and sewing flying geese with friends of friends from the Raleigh-Durham area. 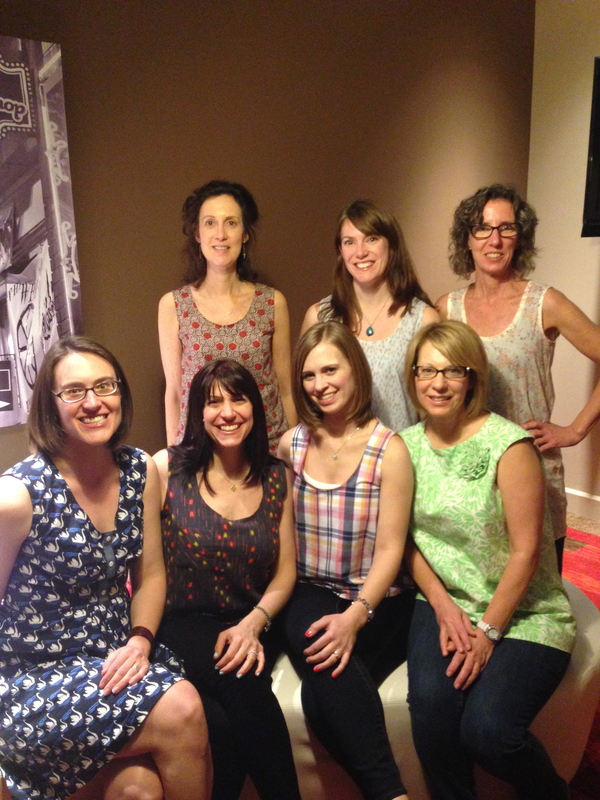 Saturday I woke up excited to learn from some of the amazing quilters leading workshops. First was Anna Maria Horner, who was just so effortlessly funny. She shared her modern corsage technique of building a fabric bouquet and set us off to make one that was our own. Let me tell you, when you show Anna Maria something and she says it’s pretty, it just might make you smile a goofy grin for the rest of the day. My bouquet, pre-assembly. I have a lot of math to do, but I can’t wait to see how it turns out. There was lunch and a lecture by Elizabeth Dackson, then we were back in the classroom, this time with my quilting idol Angela Walters. 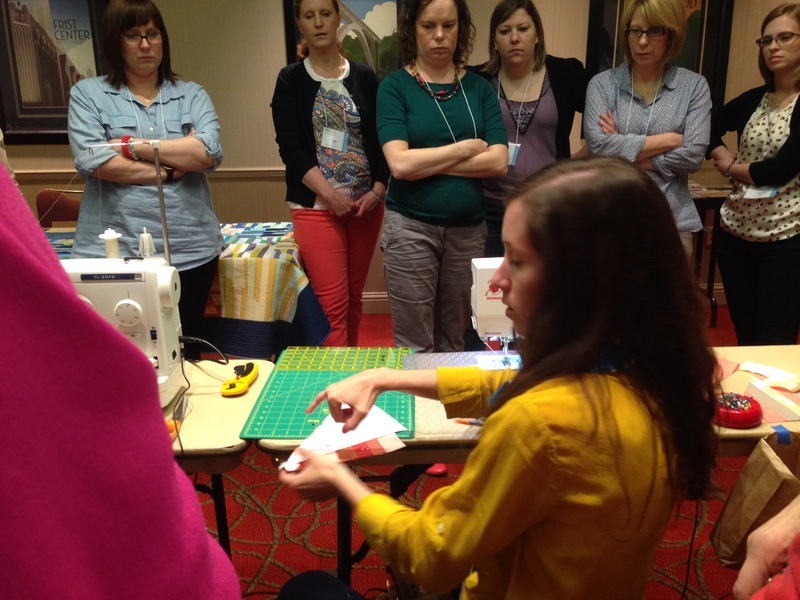 I learned FMQ watching her videos, and it was so fantastic to learn from her in person. She is just as funny and lovely and warm and real as could be. I got to see some of her quilts in person, and she was so cool about me geeking out. FMQ practice plus Angela Walters equals happy Melanie. Open Sew on Saturday night was filled with raffles and laughter and not too much sewing for me. I did make a bunch of flying geese for my husband’s text quilt and take a picture of them on the hideous hotel carpet. I also met the lovely and talented Michelle through our mutual friend Ashley who was sewing at home in New Jersey. Day two of classes, and we had so much fun improvising in Victoria Findlay Wolfe‘s class. I tried to use a LOT more color than I usually do, and I really love the blocks I made. Plus, we did some skill building and learned how to do Y seams. I definitely needed to do that in person. The lunch lecture was from Maddie Kertay of the Badass Quilters Society, and it was so inspiring and affirming. And then it was time for some paper piecing with the super talented Carolyn Friedlander. I gushed a little over her fabrics and bought some hard-to-find Architextures prints. 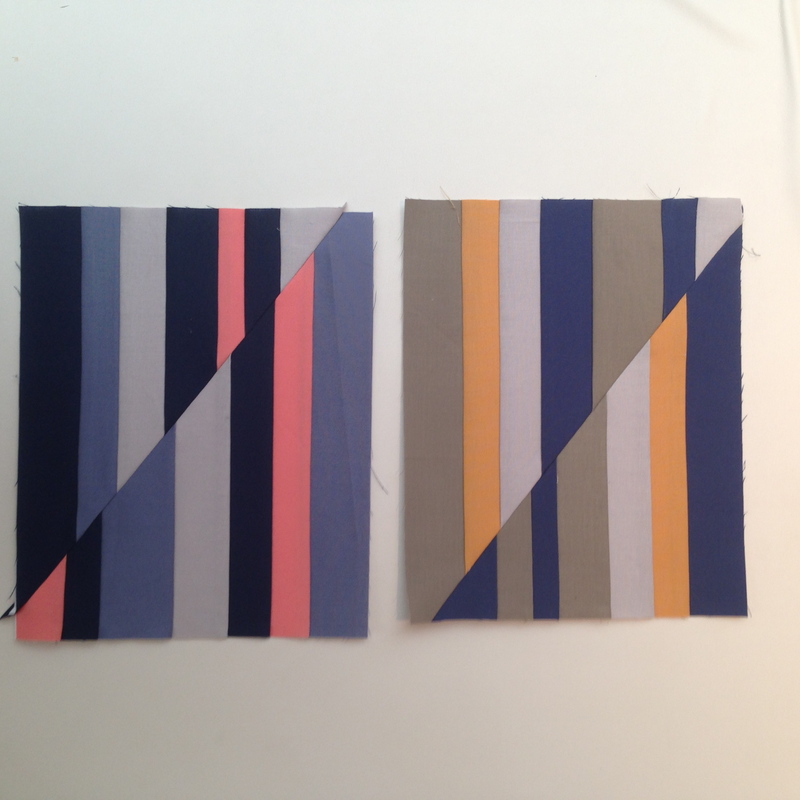 Her block was pretty straightforward and so we got to sew and talk color. Watching her combine the colors in my stack was such a highlight. And I love the blocks that I made– I’m hoping to make more once I’m unpacked and settled back in. We went straight from Carolyn’s class to the airport, and when there was some tension on the plane (the woman in front of me accused the man across from her of suspicious activity) Michelle and Daniela and I talked about all of our lovely experiences and shared stories to keep our minds occupied until we were safely on the ground in Newark. I can’t express how fulfilled and recharged I feel, so I’m going to try to show it in my work moving forward. I can’t wait to get sewing again. Sounds like it was totally awesome. I am super jealous that you got to meet AMH!! And I can’t wait to see more of your quilt! Sounds amazing, I was super jealous seeing all the photos popping up on instagram!